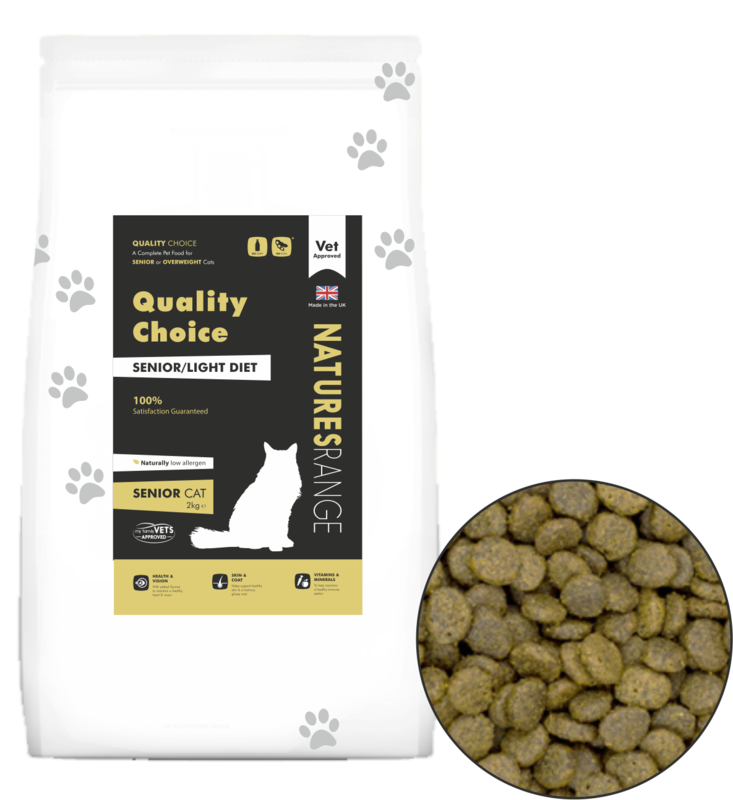 Delicious and vet approved, our senior light range is perfect for cats over 7, or those who need a low calorie diet. Our Quality Choice Senior Diet for cats is approved by vets and is perfect for cats over 7 years old or cats who need a low calorie diet. Crude Protein 32%, Crude Oils & Fats 15%, Crude Fibres 2.5%, Crude Ash 6.5%, Omega 3 0.7%. Vitamins; Vitamin A (as retinyl acetate) 25,095 IU, Vitamin D3 (as cholecalciferol) 1,730 IU, Vitamin E (as alphatocopherol acetate) 600 mg, Vitamin C (as monosodium phosphate) 300 mg, Biotin 210 mcg. Trace Elements; Zinc Sulphate Monohydrate 265 mg (Zinc 95 mg), Ferrous Sulphate Monohydrate 240 mg (Iron 70 mg), Manganous Sulphate Monohydrate 90 mg (Manganous 25 mg), Cupric Sulphate Pentahydrate 20 mg (Copper 5 mg), Sodium Selenite 0.64 mg (Sodium 0.3 mg), Amino Acids; DL-Methionine 2,000 mg, Taurine 2,000 mg, L-Carnitine 1,000 mg.